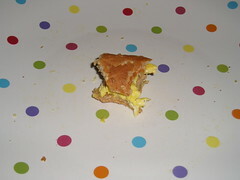 An impromptu weekend breakfast of egg sandwich on a whole wheat hamburger bun from Trader Joe’s. I also had leftover spicy Italian chicken sausage from them, that needed to be used. So I sliced it into a pan, threw in a couple of eggs, and scrambled it up on the spot. I may have put a slice of cheese on top before piling the eggs and sausage on my toasted bun (it was a few weeks ago). Quick and easy, plus the mildness of the egg and bread toned down the excessive (to me) saltiness of the sausage. That’s the problem I have with so many sausages from stores like Trader Joe’s and Whole Foods – too salty! I’m told it’s because they don’t use preservatives, but surely there’s a better way? These specialty sausages are a wonderful convenience item to keep on hand, but with all that salt, I rarely buy them.